Employees at weight loss products and services company Nutrisystem work with people all over the world. Until recently, their only points of contact were telephone calls, email and the occasional instant message. But by December 2015, the company had hatched a plan to change that. Looking at overhauling its conference rooms, Nutrisystem spent the past year implementing a new Cisco Systems phone system, along with Cisco Telepresence equipment, so that everyone could work more collaboratively — interacting face to face even when they were halfway around the world from one another. “We work with an offshore company in India that does development for us. We’ve worked with them for as long as I can remember,” says Dennis Matz, senior manager for network and infrastructure at Nutrisystem, which has headquarters outside Philadelphia. That is a story being repeated at ­companies large and small as video emerges as a requirement for most ­organizations, says Steven Vonder Haar, senior analyst for enterprise webcasting and streaming at Wainhouse Research in Arlington, Texas. Wainhouse this summer reported that 40 percent of businesses are either “very interested” or “somewhat interested” in integrating streaming capabilities with group videoconferencing systems. There are many use cases for video­conferencing, with new opportunities opening up regularly. Companies use videoconferencing for everything imaginable, from doing interviews with job candidates to onboarding new employees and training people on important procedures. Teleflex, a critical-care medical specialty device manufacturer, uses videoconferencing to reduce travel expenses. The Wayne, Pa.-based company operates 60 facilities worldwide, and requires employees to meet often — for example, during all-hands meetings twice a year. But international travel is expensive, and it’s difficult to get everyone who would benefit from meetings in the same room. Videoconferencing solves both problems, reducing costs and bringing more people together at once. “We knew what our global spend was on travel. We decided we could fund our ­videoconferencing project with a reduction in that spending,” says Vincent Voci, Teleflex’s senior director of infrastructure. Voci’s team installed RealPresence technology from Polycom, including nine Medialign systems, which combine whiteboard and video technologies; 85 RealPresence Trio conference phones; and 10 Group 500 and 700 systems. The devices work with Skype and are available to all employees, prompting the company to add two more all-hands meetings. And while the company hasn’t seen a complete return on its investment, they are certainly on their way, he says. Miles Kane, vice president of sales at Altocloud, says his company saves a lot of time with videoconferencing too. The Mountain View, Calif.-based provider of digital customer engagement tools has seen its biggest gains in productivity. “We’ve had videoconferences that only took 15 minutes that would have been more than an hour in the old days,” he says. Videoconferencing cloud technology is seeing huge growth. Nemertes Research found that nearly one-third of 132 ­companies surveyed were using cloud videoconferencing last year. This year, 40 percent report they will use a cloud-based ­videoconferencing system. 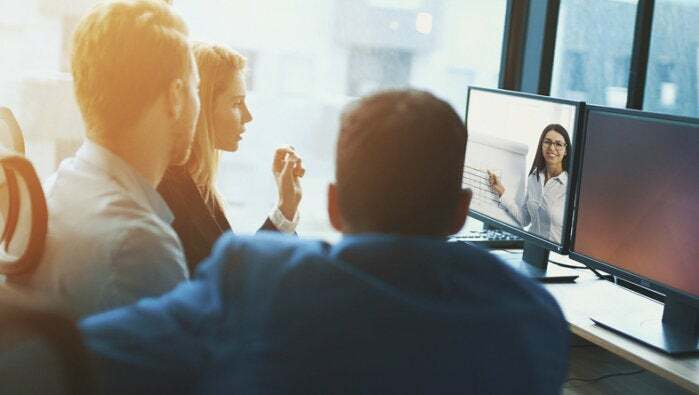 Dubbed Video as a Service, the offering is available from ­industry heavyweights Avaya, Cisco Systems, Google, Microsoft and Polycom, as well as multiple smaller players. The main benefit of cloud-based videoconferencing is that no specialized equipment is needed. Anyone with a camera-enabled smartphone, laptop or tablet and an internet connection can log on and make a video connection. It also removes quality-of-service headaches for the IT team because security, networking and software upgrades are all in the hands of the cloud service ­provider. This makes it much easier to hold videoconferences with people outside of the corporate network, something that previously often required hands-on IT assistance. For more on videoconferencing, visit here.